No. 40, Jalan SS2/72, Petaling Jaya. Business hours: 11.00am to 10.30pm, daily. CHINESE cuisine lovers are in for a real treat as Chyniis (pronounced Chinese) recently opened at SSTwo Mall in Petaling Jaya. Restauranteur KH Saw has roped in chef Lim Ching Shiung to create an extensive menu and topping the list were the well-loved Sang Har Mee and Hot and Spicy Chilli Crabs. The Sang Har Mee which is a combination of crunchy noodles, firm yet succulent fresh water prawns, and gravy richly flavoured by prawn roe, was indeed irresistible. 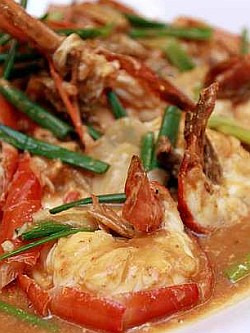 “The sauce cannot be starchy or else it will take away the taste of the prawns. “Only experienced chefs know how to cook the prawns properly, allowing the flavours of the roes to infuse into the stock over the right heat,” Saw explained. The Hot and Spicy Chilli Crabs were served with handmade mantou (steamed buns), which had a soft and springy texture that set them apart from the mass manufactured ones. Crispy Honey Squid, Ginger Wine Crabs and Crispy Fried Tilapia with Plum Sauce and Mint Leaves were the other seafood dishes we savoured. For the Crispy Honey Squid, Saw said only squid tentacles of similar sizes were used. They were deep-fried and coated with honey, sugar and soy sauce. The tilapia, on the other hand, was deboned, deep-fried then drizzled with plum sauce. Not only did the mint leaves make pretty garnishing, they also added a refreshing tang when eaten together with the fish. Ginger Wine Crabs would appeal to those who enjoy the pungency of ginger. The crabs were cooked in four types of liquor — one of them was ginger wine — thus explaining its aromatic and full-flavoured soup. 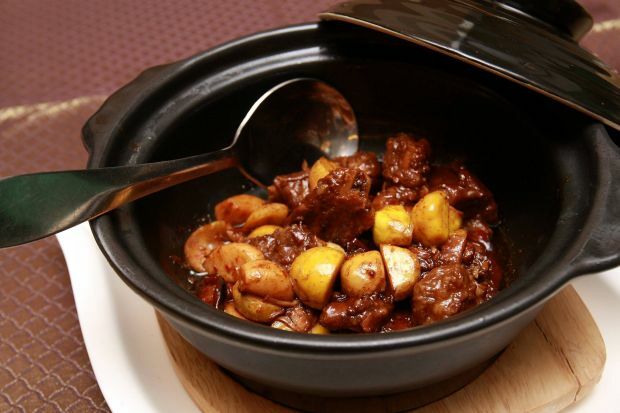 Chef Lim, who has 26 years of experience in the kitchen, also recommended a number of specialties, such as the Tawau Special Fish Maw Soup with Chinese Wine, Smoked Chicken, and Claypot Spare Ribs with Chestnuts. The soup, a common favourite in Tawau, featured chicken and ham stock enriched with crab meat, fish maw, sea cucumber, mushrooms, coriander and most importantly, Chinese wines. Preparation for the Smoked Chicken was a troublesome affair. The chicken has to be steamed for an hour before it was smoked over rice grains, sugar and tea leaves for 15 minutes. Not many would appreciate the smokey flavour but those who like it would not be disappointed. Saw’s suggestion of Fish Scale Jelly was met with a few arched eyebrows but the melt-in-your-mouth texture of the dessert proved us wrong. 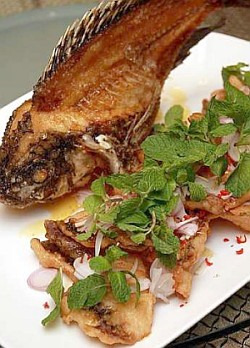 Refreshing: Crispy Fried Tilapia with Plum Sauce and Mint Leaves. We were cautious at first but there was no unpleasant, fishy odour. “Large fish scales are boiled and melted into gel,” Saw said. Having opened in January this year, Chyniis is two months shy of its first anniversary and yet expansion plan is already underway. “I am driven by a passion for food and I love to share the food I enjoy with more people,” Saw said.